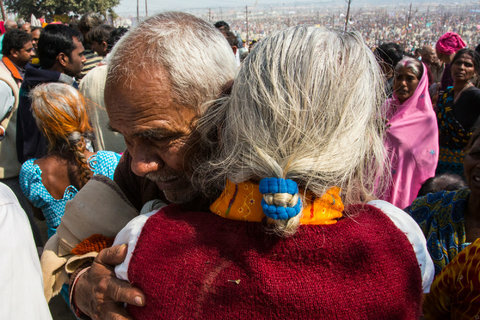 An elderly couple were reunited after being separated for several hours at the Kumbh Mela on Sunday. ALLAHABAD, Uttar Pradesh— Most people know the heart-sinking feeling of losing someone in a crowded place. Imagine the feeling of being lost at the largest gathering of humanity in the world, the Kumbh Mela. It’s a scene so dramatic, and so common, that it’s a theme in many Bollywood movies — families who attend the Kumbh are separated and then reunited decades later. Pranmati Pandey, a middle-aged woman from Bihar, knows the experience well. The mother of four was separated from her family on Sunday morning in the tide of an estimated 30 million people who gathered for the auspicious bathing day. Late on Sunday night she sat huddled with hundreds of other people, mostly women, who had also been separated from their friends and family. “I just looked away from my family to give rice to the poor people on the road,” Mrs. Panday said, too exhausted from the day to cry. “When I turned around they were gone.” She wandered around for a few hours before a benevolent stranger took her to the police. Every 12 years, an enormous pop-up city is erected on a flood plain, where the Ganges, the Yamuna, and the mythical Saraswati Rivers merge. Organizers say up to 80 million people are likely to attend the six-week event. Though there is not an official estimate of the crowds yet, the police and organizers say that on Sunday, the largest bathing day, the number of people separated from their family and friends at the mela rose above 20,000.